UPDATE: Enjoy this project for the front porch of our former home. We’ve moved and are giving our new-to-us home a complete remodel. Click HERE to see my new farmhouse style! 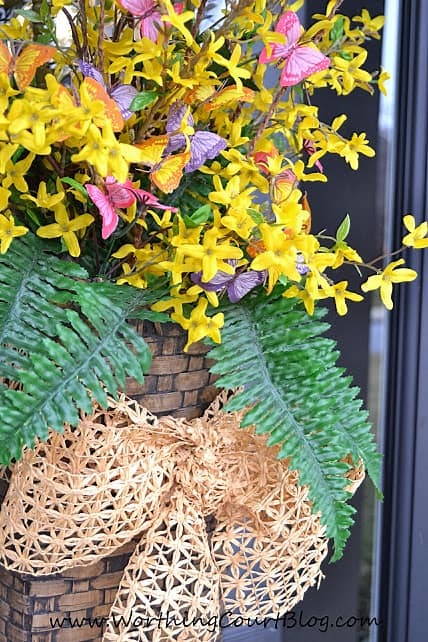 My spring door basket is filled to the brim with forsythia and butterflies and makes me happy, happy, happy! Whatever I place on my front door is meant to be welcoming to my guests. I don’t want anything skimpy or small. I want it to be large and lush! I used this door basket, in place of a wreath, as part of my Fall and Christmas decor too. It’s just so easy to work with. I already had everything in my stash and it only took about 15 minutes to put it all together. 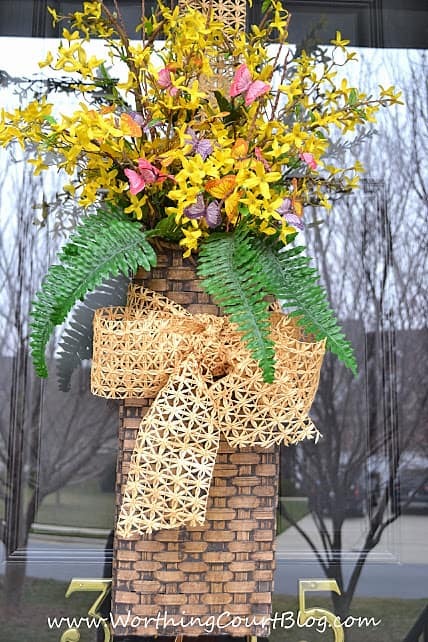 I began by tying a raffia ribbon bow around the basket. Then I loaded it up with long, glorious forsythia stems. It needed a little color so I added some silk butterflies that I picked up at the dollar store last year. And tucked in a few silk fern leaves that I clipped from a large bunch. 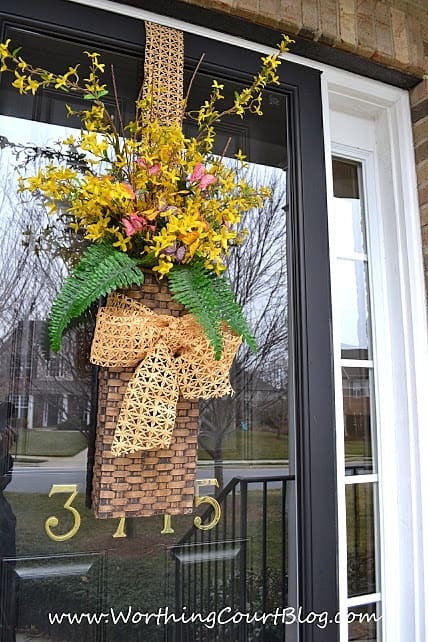 A strip of raffia ribbon running up to the top of the door gives the appearance that the basket is hanging from that instead of the suction cup that I actually used. How about you? 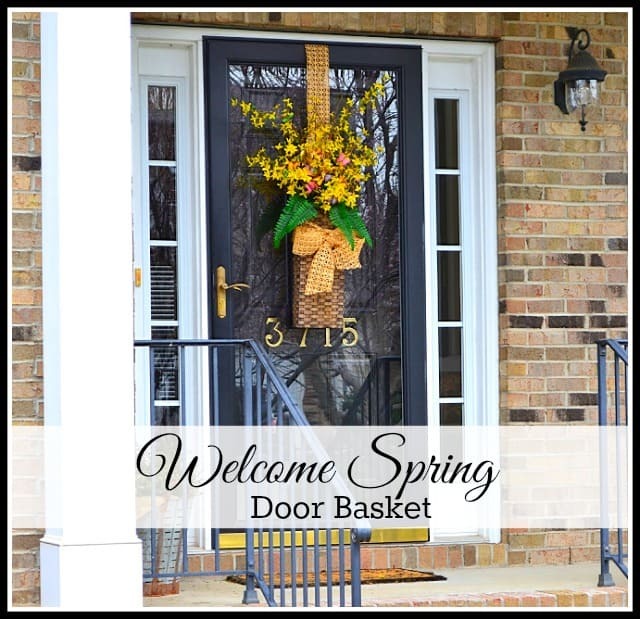 Do you add something to your front door to welcome spring? 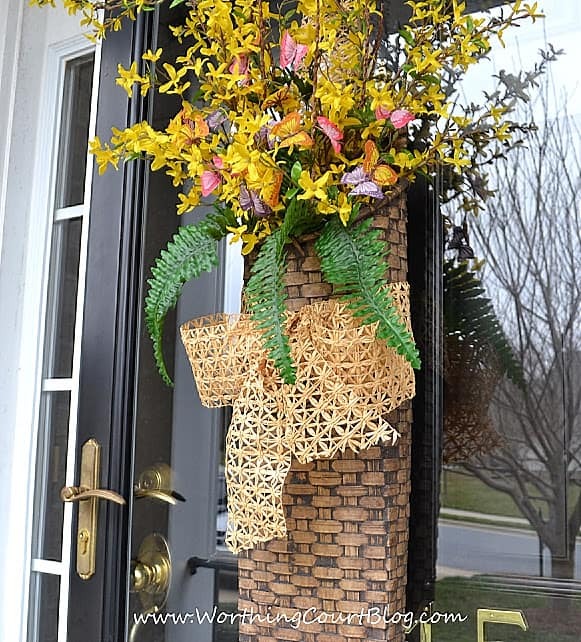 Love your forsythia-filled door basket welcoming spring Suzy! Looking forward to Swinging into Spring with you this week! I have a glass storm door like this one. How do you keep the basket and other door decorations from swinging on the door and scratching the glass? Also it becomes important how the back of the arrangement looks if you leave the door open and see the glass from inside the house. 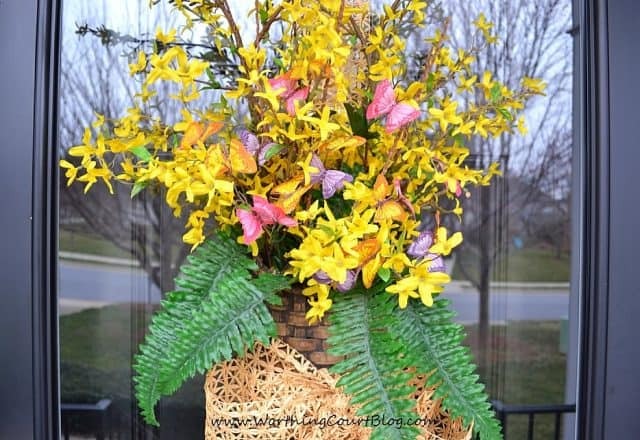 Do you have any tips for making the arrangements look attractive from both sides? Hi Robin. I’m glad you like my door arrangement. Great questions! I’ve hung everything from this basket to wooden plaques to wreaths with metal forms on my glass door and haven’t had any problem at all with it scratching the glass. And you’re right – on a glass door, the back is important too. The basket looks just fine on the back, but the back of a wreath can be kind of ugly. In those cases, I’ve cut a piece of solid colored felt or some other fabric and hot-glued it to the back of the wreath form to cover up the ugly part. Hope this helps!